You’ve just had your sweet little bundle of joy and are enjoying the postpartum glow all snuggled up in the hospital bed. Nurses, your partner, and family members cater to your every whim . It is wonderful, but it will be even better to enjoy the blissfulness that is mommy-hood at home in your own bed. So once you get discharged you pack up and get your baby in the car, head home, and then……….what!? You’ve spent nine months preparing for having your baby. Picking supportive care providers, hiring a doula, taking a childbirth class or two, touring the hospital, decorating a nursery, picking names, reading pregnancy books, and lots and lots of internet research. But did you prepare for what to do once your brought your baby home? If you’re reading this because you have just brought your baby home and have no idea what to do, don’t worry! 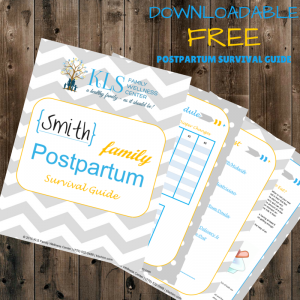 Here at KLS Family Wellness Center we want you and your baby to get the best start at home so we have made this free downloadable postpartum survival guide that you can use. If you are still pregnant then use this blog post and the guide to help make a postpartum plan. The number 1 most important thing you need to worry about is feeding your baby and yourself! Make a meal plan and put it to use. I’ve found that having 4 weeks of pre-made meal plans laminated really helps me out when I don’t feel like making up a new one every week. Be sure and take advantage of friends, family, and church. Many churches will bring meals to new moms. Ask family and friends to help out by bringing over a meal using Mealtrain.com. Don’t forget to keep track of what your baby is eating. The baby schedule allows you to track when your baby has breastfed and which side. If you are bottle feeding it also has a space to record the ounces fed. It also lets you track your babies nap schedule and record when they have wet and dirty diapers. Now that your baby is home you’ll have to get into a new routine and that takes time. Do not expect to get the same amount of work done as you did before baby was born. Delegate tasks to others. When someone comes to visit you and your new baby ask them to help sweep, vacuum, do dishes, or do a load of laundry. You might want to hire a postpartum doula to help you while you get into your new groove. We know being a mom to a newborn can be rather tiring and you may forget important phone numbers, so we included a contact list with a place for all the numbers. Especially your favorite takeout and delivery places!